Android 7.0 Nougat is already released for most of the Nexus phones. Unfortunately, Nexus 5 is not on that list. And most of the Nexus 5 users are not happy with this decision and want to try the latest version of Android 7.0 Nougat on Nexus 5. But thanks to XDA developer Santhosh M, which is working on the AOSP Nougat 7.0 for Nexus 5 and provide the initial build for users. Yes, you can try the Android 7.0 Nougat on Nexus 5 smartphone. To update your Nexus 5 with Android 7.0 Nougat all you need a phone with TWRP custom recovery. And after that, you can Download AOSP Nougat 7.0 ROM for Nexus 5 from below. Installing Android 7.0 ROM on your Nexus 5 is as easy as installing any other custom ROM. If you are new and don’t know how to flash the Android 7 custom Rom on your Nexus 5. Don’t worry here is the full and detailed instruction which you follow on your phone and update the same with the Android 7.0 Nougat. Before following this guide read all the instruction carefully and do take the backup of your phone. Warning: Tecnobuzz.net is not responsible for any damage that might happen to your phone during this process. a) Download the Android 7.0 Nougat here. b) Download Gapps Zip packages here to flash the Google applications on your phone. 1. First, you have to install the custom TWRP recovery on your phone. If you already did that then go to the next step. 2. Now download the ROM zip file and Gapps Zip file from the above mention links and save the files on your phone’s internal memory. 4. Once you are in the recovery mode. Go to Wipe > Advanced Wipe > Select Wipe cache, Dalvik cache, System, and data and swipe to confirm it. NOTE: Don’t select the Internal memory or card otherwise you will delete both the zip files that you saved on your phone. 5. Now go back to the main menu of the TWRP recovery and Tap on the install button. Locate the ROM zip file & swipe to Install the ROM file. After the process completes, Flash the GApps zip file. That’s it. Now your phone will reboot and runs on the latest Android 7.0 Nougat. 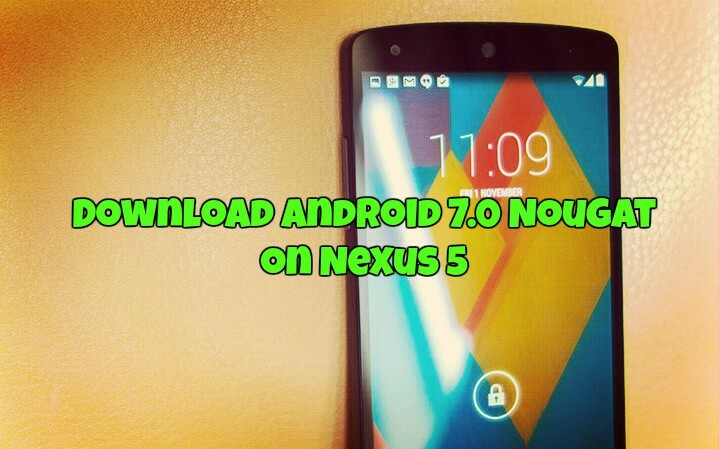 Hope you like this guide to Download Android 7.0 Nougat on Nexus 5. Let us know if you have any questions via comments below. What about the 2013 Nexus 7 which not getting Android 7 officially either.